Greetings from Mood Indigo ! MOOD INDIGO, the annual cultural festival of Indian Institute of Technology, Bombay is the biggest college cultural celebration in Asia. Continuing with its 46 year old legacy, Mood Indigo will step into its next edition in December this year. Mood Indigo has been successful in attracting a footfall of over 139000 last year, featuring a plethora of events with more than 200 international artists from over 25 countries having the Mood Indigo stage hitherto. As a purely student body, Mood Indigo strives to exhibit the vibrant culture of different countries from around the world to a youthful and energetic audience. 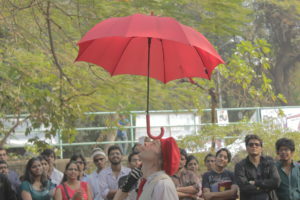 One of the best institutes of India, Indian Institute of Technology, Bombay is famous worldwide as a premier engineering institute and Mood Indigo is its internationally acclaimed cultural festival. Over the years Mood Indigo stage has witnessed Simple Plan, Porcupine tree, Karnivool, World’s Best Symphony Metal band Epica, World’s best Drummer Mike Portnoy, Ehud Segev-The Mentalizer from Israel, Mark Tully BBC chief , Prince of Mime Hanoch Rosen from Israel, Ensiferum from Finland, Minino Garay from Argentina and many more unique performances showcasing culture from a spectrum of countries. Also, in a unique showcase of legendary Japanese art of Sumo wrestling, Indian audience witnessed for the first time a live performance by World Champion Sumo wrestlers in 2010.
International Fringe Festival hosts the street and fringe artists around the world and keep the streets of Mood Indigo the best among all the cultural fests. In the recent years, we have had Yoshi Chladney from Canada, Street Circus and Equilibrium Circus from Canada, Matteo Galbusera from Italy, Feugo Loco from France, and many more on board. This year Mood Indigo’s theme being “La fete Carnaval”, which means a Carnival Celebration, our aim is to enhance and take International Fringe Fest of Mood Indigo to a whole new level. We would love to take this opportunity to invite you to our Mood Indigo 2017. Your unique act will surely enthrall the young Indian audience here.